I am so honored and grateful to have created Retreat Journeys just for you! For you to step back from everyday life, step outside your comfort zone, have experiences you never thought you’d have with like-minded friends that are on this “journey” of life with you! When I was asked in high school what I wanted to do for a living, I remember thinking “I want to make people’s dreams come true!”. I also traveled to Germany when I was 12 and fell in love with other cultures - I thought of this trip and how life changing it was for me and decided that wanted to do that for other people - so I spent 10 years in the travel industry planning dream trips for a living. Early in my career, my life went into a tail spin - while I was in college - my only sister was 17 and came down with an unexpected illness. She was only 17 - I was only 20. After 6 months of continuous hospitalization, she ended up passing away - which changed my life forever. I dealt with the loss of my only sister - which have molded who I am and my purpose to this day. I try not to have a day go by without affecting the world in a positive way. Our life is short - it’s so important we do what we’re meant to do - and to impact the people we’re meant to impact - today. In the midst of dealing with my sister’s death, I also sought out yoga for healing - mentally and emotionally - it had blessed my life in so many ways, I decided to become a teacher. About 10 years ago, my husband had another illness and brush with Cancer where I was introduced to Moffitt Cancer Center. I was so impressed with the care that he received there, I decided to dedicate the next 10 years of my life contributing to this institution. I am still there and continue to coach people on how to provide the best possible patient experience in every interaction possible. About 8 years ago - my brain child - Retreat Journeys came into being. My husband and I started hosting small weekend retreats on the small quaint Florida island of Anna Maria. These were so successful, we decided to take it “across the pond” ever since; because I absolutely adore Europe and their way of life. The European culture has a lot to teach Americans. The fulfillment that my husband, myself, and the participants receive out of the retreats is much more than I can put on paper. They are truly are magical! ﻿Roni Elissabeth is the owner of Bella Prana Yoga & Meditation Studio in Tampa Florida. Roni is an E-RYT 500hr yoga instructor, certified life coach, meditation coach, writer, and speaker. She is a contributor to FOX 13, Elephant Journal, My Yoga Online, Integral Magazine, and Tampa Bay Wellness Magazine. Roni’s time in Italy many years ago was a transformational experience, and that is why Bella Prana’s name is a mixture of Italian and Sanskrit. Returning to that sacred place will be a full circle experience for Roni. After college Roni spent two years in full-time ministry and completed the first year of her Masters in Divinity. She then decided to pursue her love of the outdoors completing 45 continuous days in the wilderness in Outward Bounds Instructor Training. Not long after, Roni continued her education and was trained as a Wilderness Emergency Medical Technician. Roni loves to travel and has visited and backpacked through over 13 countries. In light of her previous mission work in Nicaragua and Costa Rica, she decided to put her new medical skills to use, working with AIDS and malaria patients for two months at a rural clinic in Africa. It was shortly after she returned from Africa that an unexpected period of depression led her to the practice of meditation. In the search for more information on this ancient practice she learned of the intimate relationship between meditation and yoga. Experiencing stillness and awareness helped to pull her out of depression and she quickly wanted to share this transformational practice. Roni’s yoga classes are a special blend of spirituality, life coaching, and yoga. As a speaker Roni finds a way to cut to heart of the message, leaving people energized about the new ways they can encounter their life. As a writer she is able to dive even deeper into the endless topics that the daily experience of life provides. Roni candidly talks about the questions of the heart that we all share and helps us shed the addictive but completely transparent lies that stand in our way from experiencing a radically peaceful life. To connect with Roni visit her website at www.ronielissabeth.com. Roni joined us for 2014 Ischia, Italy and will be co-teaching with Sherry for the 2016 Corsica, France and 2017 Santorini retreats. Ellen MacKay began teaching yoga in 2007. Since then, she has taught more than 2500 hours of yoga, earning the title of Experienced Registered Yoga Teacher through the Yoga Alliance. Her clientele has ranged from triathletes to people living with multiple sclerosis and fibromyalgia. Ellen played a major role in opening and managing a local yoga studio from 2008-2011. Continuing education is very important as a teacher and Ellen has trained under master teachers such as Karen Stephan, Shiva Rea and Stephanie Keach. She has also received specialty certifications in Restorative and Prenatal Yoga. Ellen’s passion for helping people heal their physical and emotion bodies through yoga has only grown as she continues to teach. As the mother of two small boys, her traveling adventures have been focused on the beauty of the US. Her dream has always been to travel to Santorini and it has now become a reality! Ellen is excited to share in the adventure of a foreign land while also helping you to discover the territory of your soul. 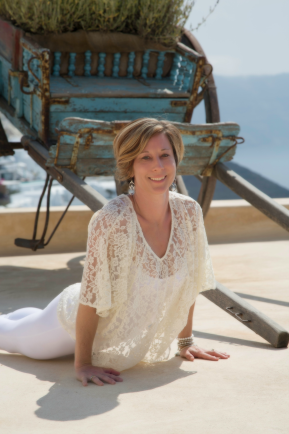 Ellen joined us for our 2015 Santorini retreat.